Winter is almost here. This means colder temperatures and snowfall. As a business owner, you may be asking yourself the effects snow can have on your flat roof. Flat roofs have a lot of advantages, but they may suffer during the winter months. At RoofSlope, we want to provide you with all the information you need in order to best care for your flat roof during the winter. Ponding/Bowing: As snow falls, it can accumulate on your flat roof putting unnecessary weight on the structure. This down-bearing pressure can cause the roof to bow, and result in ponding under the roof structure. Since snow falls at slow, steady speeds, large quantities of snow can fall on the roof, resulting in bowing. Ponding water on roofs not only affects the integrity of the roof materials but can also interfere with the function of the HVAC and other electrical systems. Once water begins to pond on a flat roof, it can lead to the following problems. Freeze-Thaw: When the snow melts on a flat roof, it can cause ponding. This accumulation of water could evaporate, but generally, with colder temperatures, the water will freeze again before it exits the roof. When water freezes, it expands. This means that water that has seeped into cracks or crevices on the roof is subject to further damage as the water continues to freeze and thaw. Leaks: Another possible damage that can result from ponding snow water is leaks. With the added weight from snow build-up, the roof may bow and water may find its way into the building itself. Leaks are usually a gradual problem, hard to detect at first, but can result in costly damage to the roof itself. If snow loads are not properly removed, the roof can collapse (worst-case scenario) which can lead to costly repairs and safety concerns for all those who work in the building. If you are concerned about the integrity of your flat roof, look for following signs of potential damage from snowfall. The good news is, despite the harsh effect winter weather can have on your flat roof, there are several preventative measures to take in order to avoid significant damages. Before the first snow even falls, create an emergency plan for dealing with winter storms. 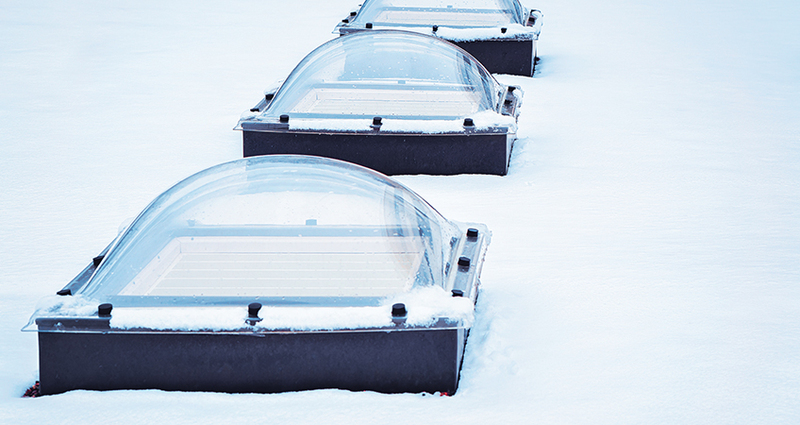 Determine the maximum amount of snow accumulation your flat roof can handle. Have regular roofing inspections to determine the integrity of your flat roof and if all the draining avenues are in working order. Clear away large amounts of snow fall from the surface of the roof. 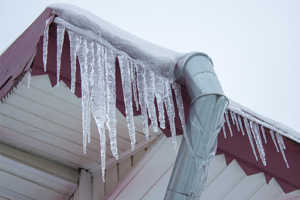 Remove ice dams immediately in order to prevent ponding and future occurrences. Whenever removing snow, take note of the location of pipes and vents to prevent damage to these structures. Use de-icing or melting products that are suitable for the type of roof membrane. Clear gutters and drain spouts of any accumulation to ensure proper drainage when the snow begins to melt. If you are uncomfortable removing the snow yourself, hire a professional snow remover to safely and effectively remove the accumulation. Maintaining the integrity of your commercial flat roof is a year-round job. Take these preventative measures to ensure that your flat roof is ready to handle the stress of winter weather. For questions on caring for your flat roof during the winter season, contact us today!